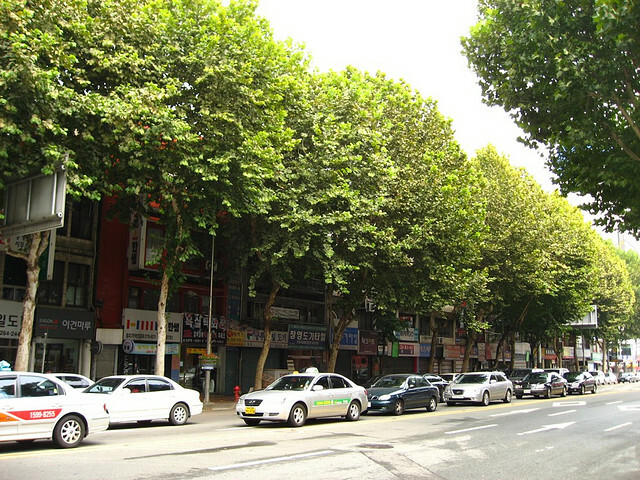 Tree-lined streets, like the ones seen here from Seoul, Korea, can have a significant impact in improving air quality in cities. Photo by Abby Yao. A new study out of the University of Kent in the UK found that a 10 percent increase in urban tree coverage in mid-size cities, like Leicester, can absorb about 12 percent of carbon emissions, contributing to cleaner air. The study is yet another addition to the argument that any sound urban planning or transit policy to improve air quality must be supplemented with green spaces. To reach their intuitive, yet essential, conclusion the conservation scientists first calculated tree density and vegetation on a city-wide scale, and later derived the biomass and carbon storage potential in each vegetation category. Based on their calculations, the researchers found that above-ground vegetation stores 231,521 tons of carbon, of which 97.3 percent is stored by trees. And although the study brings some much needed positive news to the greenhouse gas debate, the researchers express the importance of maintaining this valuable resource for the city’s air quality. The study comes at a time when UK officials set a greenhouse gas reduction rate of 80 percent by 2050, based on the 1990 levels. With both the study and the realities of managing GHG emissions, the researchers highlight the importance of local authorities in accomplishing ambitious national goals. No Room to Play in Cities?